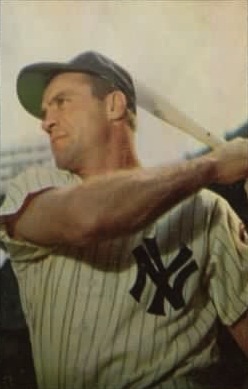 A popular phrase refers to “diamonds in the rough,” and few people embody the truth of this sentiment more than Hank Bauer, a legendary baseball player whose difficult childhood and harrowing experiences in the Pacific theater of the Second World War – which included fighting in the bloodiest battle of that theater, the Battle of Okinawa – no doubt played a great role in shaping him as a hero both on and off the baseball field. 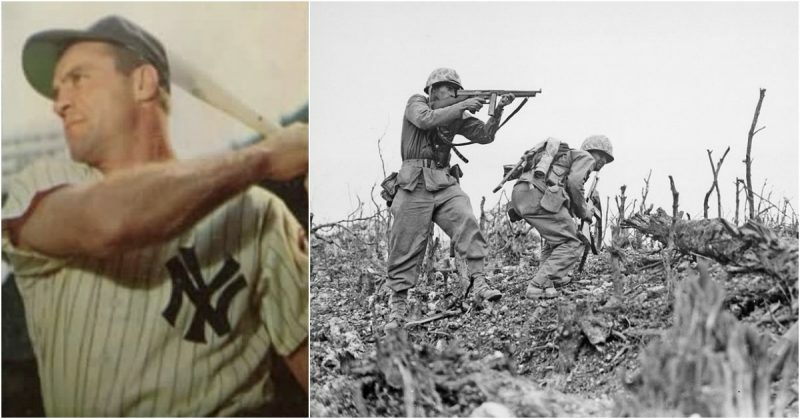 After surviving some of the most intense fighting in the Pacific and earning a number of decorations, Bauer went on to achieve massive success on the baseball field in the decades after the war. Bauer was born in East St. Louis, Illinois, in 1922. He was the youngest child of an Austrian immigrant family, and had eight older siblings. His father lost his leg in an aluminum mill accident, and the family found themselves in a situation of such dire poverty that Hank and his siblings had to wear old feed sacks as clothes. Far from stewing in misery and despair about his circumstances growing up, however, Bauer was determined to work his way out of poverty and make a success of his life. From an early age it became obvious that he was a gifted athlete, and he excelled at both baseball and basketball. After graduating from school in 1941, he took a job repairing furnaces at a beer-bottling plant. His brother, also a talented baseball player who had gotten into the Minor League, was able to get Hank a professional tryout. His tryout went well, and Hank was offered a contract with the Oshkosh Giants. Just when it seemed that Hank was about to step into the professional baseball career he had always dreamed of, though, something happened that would change his life, and the lives of many other Americans: the attack on Pearl Harbor in December 1941. 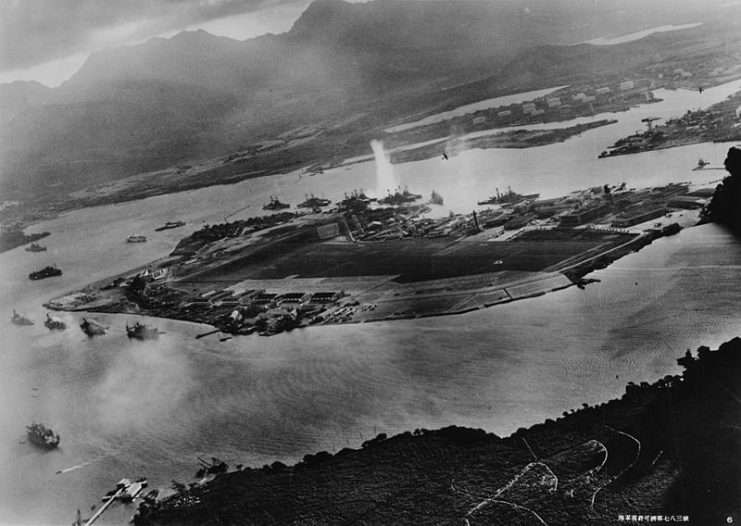 Photograph taken from a Japanese plane during the torpedo attack on ships moored on both sides of Ford Island shortly after the beginning of the Pearl Harbor attack. A month after the Japanese attacked Pearl Harbor, Bauer enlisted in the Marine Corps and initially served with the 4th Raider Battalion. Pretty much as soon as he arrived in the South Pacific, he contracted malaria. This was not going to be the first time he contracted the disease – he would end up contracting malaria another twenty-three times. Just as he had dealt with any other hardships life had previously thrown his way, he simply gritted his teeth and fought through it without a word of complaint. 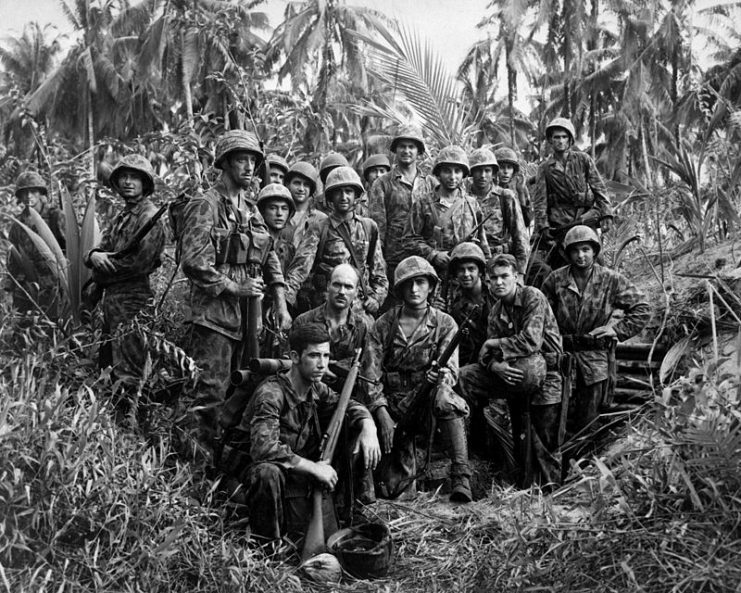 Marine Raiders gathered in front of a Japanese dugout on Bougainville. 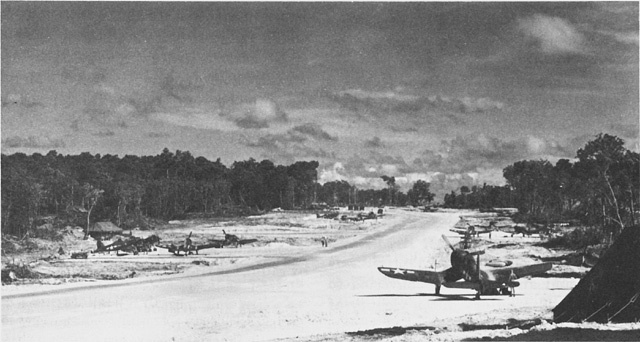 After this, the Raider regiments were absorbed into regular Marine units, and Bauer served with the 2nd Battalion 4th Marines, part of the 6th Marine Division. He fought on the islands of Emirau in Papua New Guinea, and then on Guam, where he received his first wound after being hit with shrapnel. 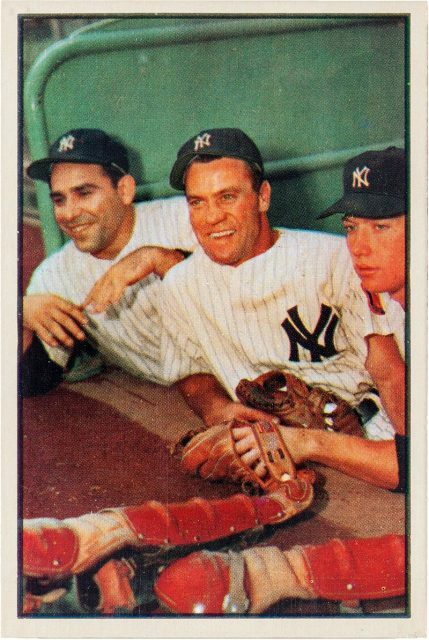 While he was decorated with the Purple Heart for his injuries, he would end up keeping another souvenir of this battle for many years: some pieces of shrapnel stayed in his body, and would end up being picked out of his back by his Yankee teammates in locker rooms many years later. After Guam Bauer, who was now a sergeant, and his Marines joined the Battle of Okinawa, which would turn out to be the bloodiest and one of the most ferocious battles of the entire Pacific theater of war. Bauer commanded a platoon of sixty-four Marines, of which only six men – including Bauer – survived the intense fighting. Bauer fought on for fifty-three days before he was wounded by shrapnel once again. This time it was serious enough to result in his being sent back to the U.S. to recover from his injuries. 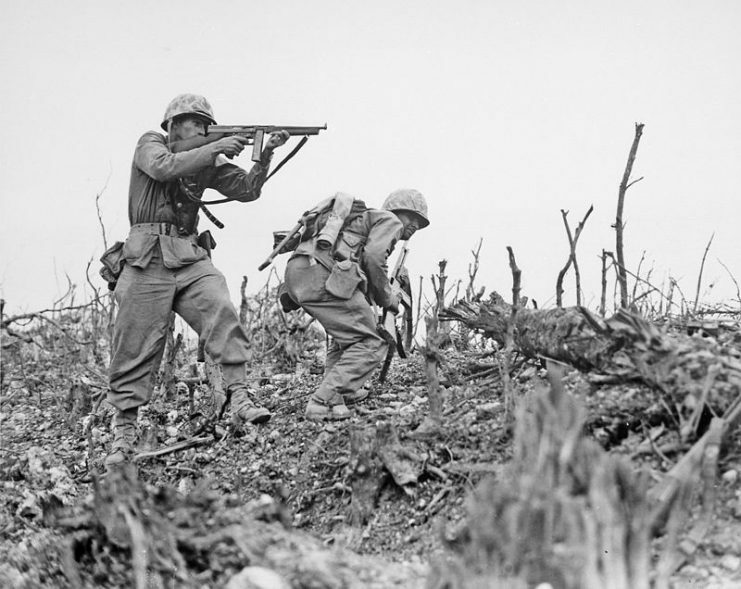 Two Marines from the 2nd Battalion, 1st Marine Regiment during fighting at Wana Ridge during the Battle of Okinawa, May 1945. While he was recuperating stateside, the U.S. dropped atomic bombs on Hiroshima and Nagasaki, thus forcing the Japanese to surrender. When Bauer had healed and was sent back to his unit, he spent the remainder of his military service on occupation duty in Japan. He ended up being decorated with the Navy Commendation Medal, two Purple Hearts, and two Bronze Stars. Owing to his war wounds, Bauer didn’t really think that he stood much chance of resuming his baseball career, but, as he had done with everything in his life, he gave it a shot anyway. A Yankees scout remembered Bauer from before the war, and signed him to the Quincy Gems, the Yankees’ farm team, in 1946. With his talent and determination, Bauer worked his way up. In 1948 he was called up to the Majors – and the rest was history. Bauer ended up being named an all-star three times, and finished his Major League career with a batting average of .277. He once had a seventeen game hitting streak. Even when he quit playing, he moved on to coaching and managing. He ended up as the manager of the Baltimore Orioles, which he led to a World Series championship in 1966. Hank Bauer passed away in 2007 at the age of eighty-four, and will not only be remembered for his success as a baseball player and manager, but also for the grit, valor and determination he showed as a Marine during the Second World War.